Hey y’all, I’m so excited to have you all here today. Why? Well one reason is…IT’S FRRRIIIIDDDAAAYYY! And just incase you need another reason, I have Tonics on my blog today. But not just any Tonics, oh no, 3 amazing customs. As if my might collection of Tonic polishes weren’t enough to keep me happy, Lindsey goes and creates not 1, not 2 but 3 customs. Well actually, she prototyped 3 for me and I couldn’t choose just one so she sent me all 3 #becausesheisamazing! Sweet Bubblegum Kisses was named by my oldest daughter, Xylana. Immediately after showing her this polish she yells out “Bubblegum”. Because she is so sweet, I stepped the name up a notch. 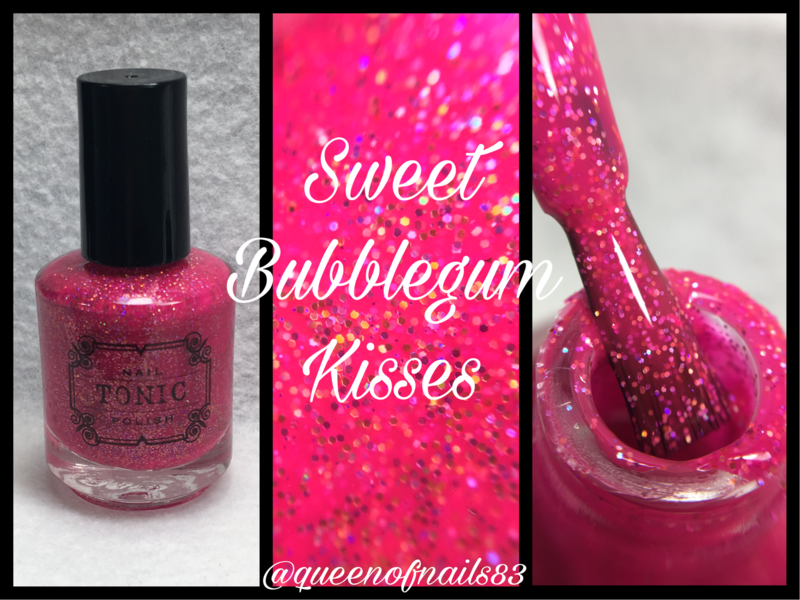 Sweet Bubblegum Kisses is a bright Barbie pink crelly with pink, lavender and silver holo microglitters. Cotton Candy Hugs was named by my youngest, Xadrian. She loves herself some cotton candy, thus was born Cotton Candy Hugs. Cotton Candy Hugs is a bright raspberry with pink shimmer packed with silver ultra holo glitters. Hard Rock Candy came from my hubby who always helps me when I’m in a pickle. I wanted something along the lines of candy but still wanted to keep it fun. With all the beautiful glitters in this one, Hard Rock Candy only seemed appropriate. 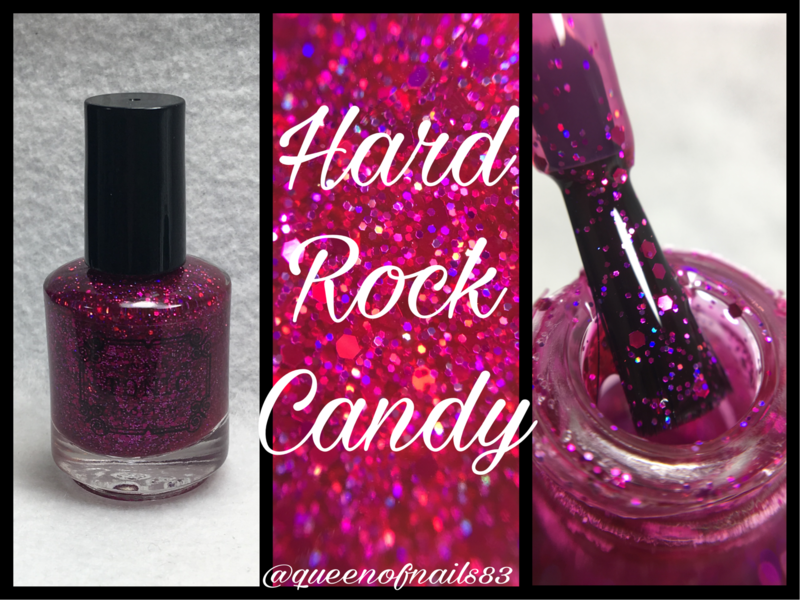 Hard Rock Candy is a raspberry jelly base packed with various size pink holo glitters. The moral of this story is…if you haven’t included Tonic in your collection, I beg of you to stop wasting time, pull the plug and make a purchase. I guarantee you will not regret it. 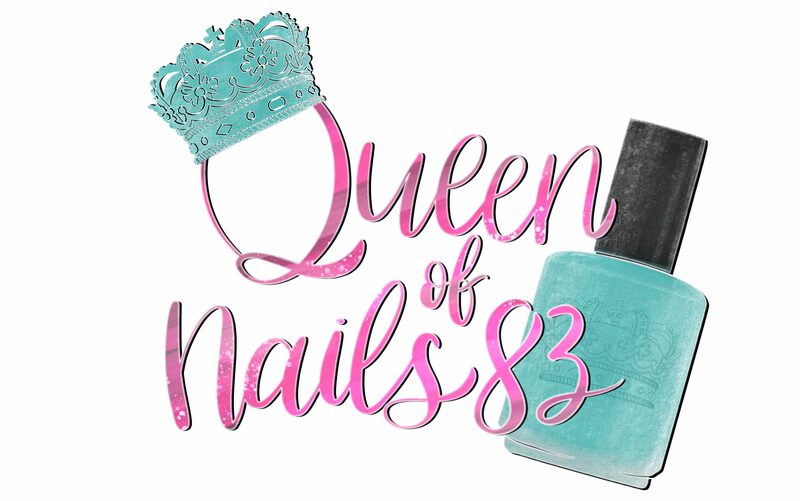 This brand is new just hitting the indie scene back in June but already Lindsey has gained so much well-deserved notoriety. Tell me in the comments which Tonics you known or what’s on your wish list. well…I love those pinks. Too much. Those are so pretty! I love me some pink polish! I adore pink nail polish!! These are fabulous. These are all gorgeous on you! What a lovely trio of pinks!